While listening to a recent Richard Fisher interview I was reminded of the main problem of this current sloooow economic recovery. The US Economy is certainly growing, bu it has not grown at its fullest potential and continues to plod along at a slow pace. Fisher’s comments were from a worried stance. Being a Hawk (non advocate for additional help from the FOMC) his fear is once the economy gets going, it may take off too fast. Maybe he is correct, but for now, we could only be so lucky. 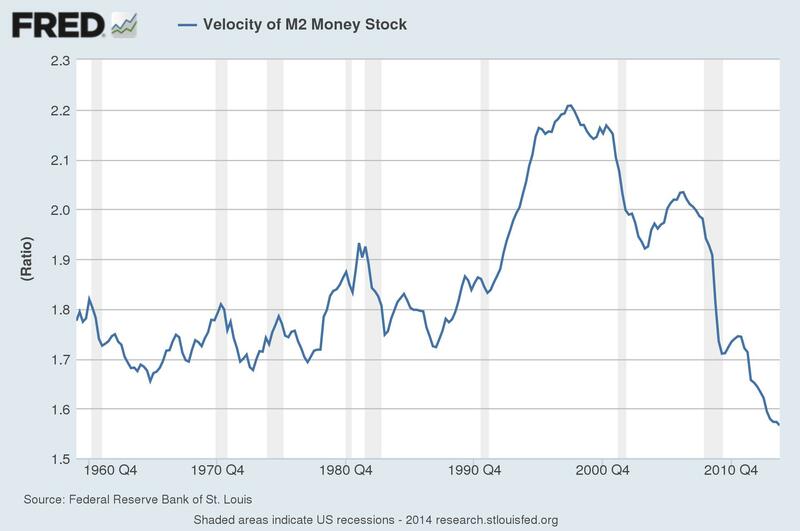 In non-fancy terms, M2 is money in motion. The FOMC has been pushing money into the banking system for some time. Let’s see if it is helping speed up M2? To be fair, in order for M2 to accelerate, there must be demand for loans, and other money movement by the businesses and citizens of the US. So far, as you can tell, Fisher’s worries are unwarranted. A spike or even blip upward would be nice! This entry was posted in Economy and tagged FRED, M2, Richard Fisher, St Louis Fed, Velocity of Money. Bookmark the permalink.